The team will be working along the stretch of the canal by the boundary of the cricket pitch at Kempsford Manor this summer. The task will be to clear undergrowth and fallen trees from the line of the canal. The intention is to preserve an important part of Kempsford's heritage and, in the future, create an open air classroom where children can learn about the canal, the environment and ecology. If you have any old photos of the canal in, or near, Kempsford, this would really help with putting together some teaching material. Volunteers will be working every Thursday evening through the summer, weather permitting, from 5:50pm until the light gives out, or 8:30pm; whichever comes first. 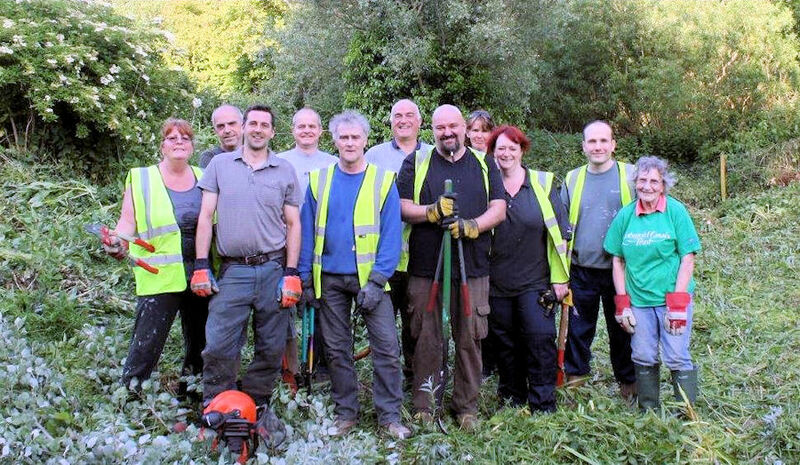 If you would like to come along and volunteer to help, or just see what is going on during a Thursday evening, you can gain access to the site through the cricket pitch entrance at the rear of The George, High Street, Kempsford, GL7 4EQ. If you do park in the pub car car park be sure to pop in for a glass of your favourite refreshment before you leave. The food is very good too. The Cotswold Canals Trust would like to thank Ipek Williamson and Gill Northen for granting permission for the work to be done.